Many youth organizations boldly state “We listen to youth.” But do they really? 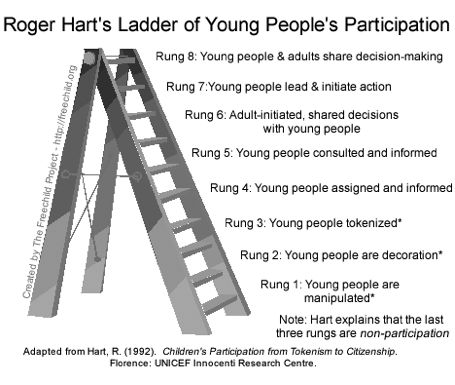 Roger Hart’s Ladder of Participation work makes us think about the levels of youth voice that youth programs incorporate – from manipulation to tokenism and all the way up to sharing decisions equally. How can we get to the top? Check out this resource. Along with some great activities to empower youth and adults to set the stage for youth voice, they outline some concepts for supporting it. Adults provide enthusiastic support and encourage youth to take risks. Youth feel empowered to take advantage of opportunities to use their voice. If the young person feels the group values their opinion, they’ll share much more information. Think back to childhood. You know that adult who listened to you, who believed in you. What did they do? Mimic that! Youth want to feel component in their roles. Adults can prepare young people for leadership. This could be a training before having them lead a group activity or personal coaching before they speak to a political figure. Many boards have a young person or two as board members. Allow youth to make real choices about their program or goals. This moves beyond setting the meeting time, or selecting the next activity. Introduce the youth to programming planning and goal setting. With youth at the table, you will find the depth of programming so much greater. And so much more fun to do! View success from the eyes of the young person. This doesn’t mean saving them from your perception of failure. It involves supporting them as they plan, take risks, and understand how to solve a problem. Their success may look different than your definition of success. Reflect on the goals of the program. A key component of youth voice is valuing peers and their contributions. Create an environment where all young people can have their voices heard. This is where facilitation skills can shine. As an adult, build in ways to hear everyone – this could be allowing small group time or pair-and-share time. For those who prefer to write, throw up some white space for youth to express themselves. How do you incorporate youth voice into your program? In the in-school program for teens that I lead, we look at Roger Hart's Ladder and dissect it together. I have found that it provides young people with the language and vocabulary to talk constructively about youth voice. After young people understand and embrace their voice, they feel totally comfortable calling me out if there is not enough youth voice in the program. I love it! It is a great "checks and balances system"! I have utilized Hart's Ladder throughout my youth development career as a "checks & balances" system (thanks Courtney for that language). It is a framework I go back to again and again when working along side youth or training staff and volunteers about youth voice. I utilize this framework in the Youth Work Matter online course (http://www.extension.umn.edu/youth/training-events/youth-work-matters-online/index.html) and has had great discussion with participants as a tool to "measure" their level. Thanks Karen for highlighting this, I believe it is a great foundational framework for youth development professional to understand.